Steve Morison heads goalwards for Leeds. Leeds United’s group of strikers has increased at some expense this summer but it was left to Steve Morison, the club’s longest-serving forward, to earn a draw in their first friendly at Harrogate Town last night. Morison converted a diving header three minutes into a second-half appearance, averting defeat against a disciplined and adventurous non-league side. New head coach Uwe Rosler, who took charge of Leeds for the first time at Wetherby Road, gave non-competitive debuts to summer recruits Lee Erwin and Chris Wood before half-time but United were a goal adrift at the break and needed Morison’s goal to force a result. Rosler played down the importance of the scoreline before kick-off but called for a performance of “high intensity” and the team used after half-time delivered on that demand after a low-key start to the club’s pre-season programme. Leeds’ German boss, as he said he would, fielded different line-ups at the start of each half, both showing a mixture of experience and prominence. His side before the interval was loaded with Wood and Erwin and two other forwards in Mirco Antenucci and Nicky Ajose. For the second 45 minutes, Sol Bamba was given the chance to reintegrate himself in a team which also included Billy Sharp. Sharp is the player generating most outside interest at Elland Road and, speaking ahead of the friendly in Harrogate, Rosler did not go so far as confirming that Leeds would keep him for the start of the Championship season but the 29-year-old was part of the plan last night. United were searching for an equaliser by the time Sharp took to the field with Morison. Rosler’s system in the first half relied on a back three and Ajose and Byram as wing-backs, leaving Erwin to tuck in behind Wood and Antenucci, but the better chances and the opening goal fell to Harrogate. Goalkeeper Marco Silvestri pulled off a point-blank parry with his first touch after his defence misjudged a high ball and left Cecil Nyoni clean through and Silvestri reacted well again moments later to beat away a free-kick from Joe Colbeck. 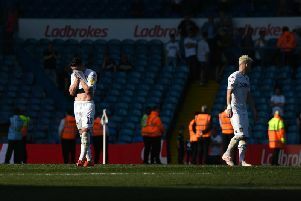 Leeds redressed the balance of the game soon enough and pressure from Erwin drew a tackle inside the box which would have earned him a penalty in a more competitive match. Wood then scraped the side-netting after breaking from halfway and beating three Harrogate players but Town forced another two good blocks from Silvestri inside 20 minutes. The hosts survived two near misses of their own as Peter Crook got a hand to an Antenucci shot and Wood dragged a good chance wide as Erwin cut open the right side of Harrogate’s defence but the Conference North club took the lead in the 31st minute. Silvestri was called on again when Paul Clayton’s free-kick flicked off a two-man wall but Nyoni was first to the rebound, completing the simple task of driving the ball into an empty net. Harrogate were worth their advantage at half-time but Rosler’s change-around, moving to a 4-3-3 formation, had an immediate effect. Three minutes after the break, Souleymane Doukara picked out Morison with a curling cross and the striker buried a diving head from six yards out. Morison almost scored again just before the hour when Charlie Taylor’s low cross forced some desperate defending from Harrogate in their six-yard box and Town became trapped behind the halfway line as the friendly edged towards full-time. Sharp was denied by a brilliant reaction when his fierce volley flew at Town’s keeper on 67 minutes and Morison narrowly failed to bury the ricochet. Harrogate almost nicked a late win when Jack Emmett’s free-kick dipped past a post and a block from Bamba prevented last-minute embarrassment but the opportunities were rare breaks in United’s second-half pressure. Leeds’ next friendly takes place away at York City on Wednesday. United (first half): Silvestri, Byram, Wootton, Bellusci, Cooper, Phillips, Mowatt, Antenucci, Ajose, Wood, Erwin. United (second half): Silvestri (Horton 74), Berardi, Bamba, Killock, Taylor, Sloth, Bianchi, Cook, Doukara, Morison, Sharp.